Wherever you go, it’s important to prepare for the effects of travel on your mental well-being. In honour of Mental Health Month we have updated our Travel and Mental Health Series to provide you with advice for a healthy and safe trip. Topics include travel and depression, substance use, anxiety, psychosis and travel stress. Access the full series here. Travel is an exciting opportunity to explore new places, people, and activities. However, being away from familiar surroundings and dealing with change can be challenging for some travellers; feelings of anxiety can reoccur or emerge for the first time. Anxiety disorders are manageable and if you prepare in advance and are actively coping with your anxiety, you can travel safely and enjoy your trip. Anxiety is a mental health condition characterized by continuous and excessive worry, nervousness, or tension. It is a condition that often co-exists with other mental health conditions like depression. Anxiety disorders include panic disorders, obsessive-compulsive disorders (OCD), phobias, post-traumatic stress disorder (PTSD) and social anxiety disorder (or social phobia). Feeling anxious occasionally is a common response to many situations and tasks, but a persistent state of uncontrollable anxiety can affect your ability to participate in daily activities and relationships. Feelings of intense anxiety can lead to a panic attack, a sudden and short-lived response (typically lasting 10-30 minutes) to psychological stress. For some, a panic attack can be a one-time occurrence while others may experience reoccurring attacks, known as a panic disorder (see our Travel and Anxiety tipsheet for more information). Anxiety can disrupt your travel plans since travel stress, jet lag, and culture shock can exacerbate anxiety and worsen symptoms. 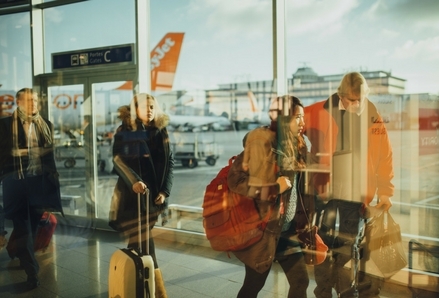 Common travel-related anxieties include fear of flying (aviophobia), being in a confined space (claustrophobia), or crowded areas (agoraphobia). If you have no prior history of anxiety, suddenly developing symptoms can be frightening. Being away from home, not being able to communicate your distress in a different language or knowing why you’re experiencing anxiety can further increase stress levels and worsen symptoms. Choose a low-stress destination and map out your itinerary. Book the most direct route possible to your destination and travel with a trusted friend, family member, or professional travel companion. If you are travelling alone, set up regular check-in times to reach a family member or friend. Consult your healthcare practitioner to discuss if the type of travel you are planning is right for you. Get advice on how to stay healthy and cope with the effects of travel stress and jet lag. Ask if you can stay in touch with your healthcare provider during your trip. Learn what triggers your anxiety and practice coping mechanisms and strategies to help you respond to stressful situations while you are away. Find a reputable mental health professional at your destination who speaks your language. You may want to contact them prior to your trip to ensure continuity of care. Familiarize yourself with the psychiatric healthcare system and cultural perceptions of mental health at your destination country. Know what steps you need to take in case of an emergency. Give yourself plenty of time to arrive and go through security checks. Note that airports, train stations, and bus depots generally have medical facilities that can provide you with assistance. Establish a routine that sets the tone for your trip. Familiarize yourself with your surroundings and try to integrate activities you are used to doing back home or bring you a sense of comfort. Bring a calming item (book, mobile device), memento, or journal that provides comfort during stressful situations. Practice relaxing breathing exercises and integrate physical activity like walking, stretching or meditating to relieve stress. Get the appropriate amount of sleep, eat a healthy diet, and stay hydrated. Know your mental and physical limits. Regularly reassess your original plans and change them to minimize stress levels. Try to maintain a positive attitude and be mindful that you cannot control everything; be flexible and willing to adapt to your circumstances. Continue taking any medication routinely and consistently. Do not stop or decrease the amount of medication you take unless instructed by your healthcare practitioner. Do not drink alcohol if you are taking psychiatric medication. Book an extra day or two off after you return to mentally and physically recover from your trip. This will help you adjust from jet lag and help you get back into your daily routine. Follow-up with your healthcare practitioner if you needed emergency care abroad or to address any concerns you may have related to your post-travel adjustment. Photo by Negative Space, Pexels.